while men do not cross. A bridge is a man crossing a bridge. The migratory capacity of man, created new urban concepts and landscape in the industrial revolution, from here born the need to conect with other territories, generating a displacement need that is in constantly dynamics and growth, consolidating large structures representing the functionality and importance of territory, but when man created new forms of connection and transport, ancient structures lose their foundation, and space must be transformed. How can we become disconnected from the story and connect with the new territories built? 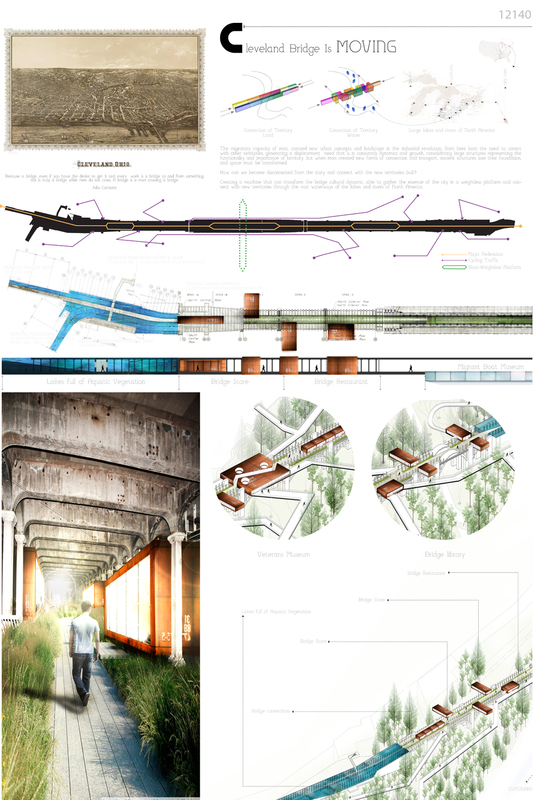 Creating a machine that can transform the bridge cultural dynamic, able to gather the essence of the city in a weightless platform and connect with new territories through the vast waterways of the lakes and rivers of North America. Everything begins with the feeding of large containers of history and culture, creating spaces for different activities mutate resulting from the dynamics of the bridge, major pedestrian and cycling traffic, stressed by the big hits POOL EAST AND WEST catacombs conceived as lakes full of aquatic vegetation and an aquarium, and small islands off the cultural scenarios. 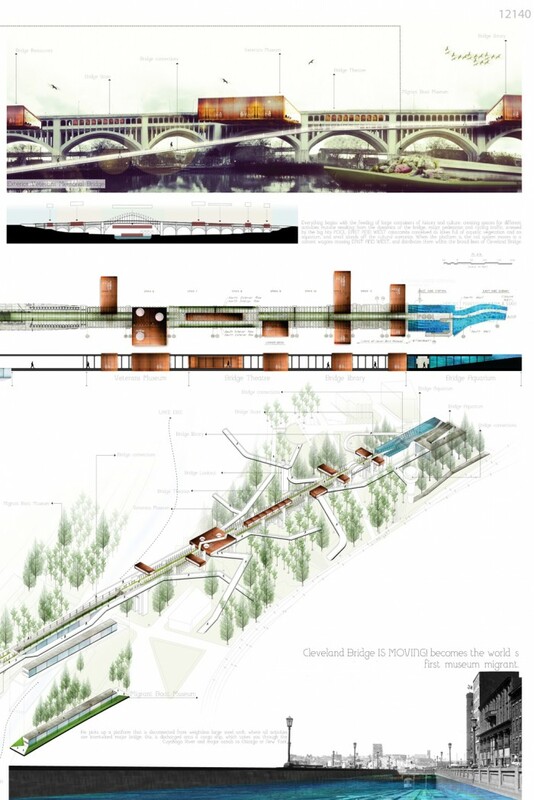 When the platform is, the rail system moves in a contest wagons crossing EAST AND WEST, and distributes them within the broad lines of Cleveland Bridge. 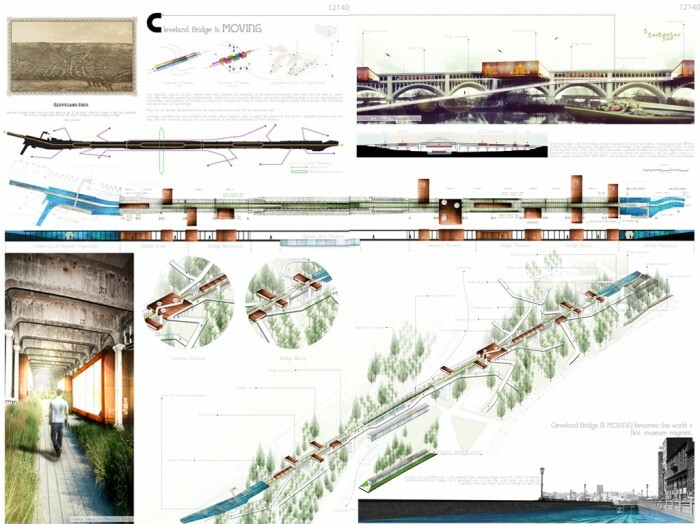 He picks up a platform that is disconnected from weightless large steel arch, where all activities are intertwined major bridge, this, is discharged onto a cargo ship, which takes you through the Cuyahoga River and major canals to Chicago or New York. Cleveland Bridge IS MOVING! becomes the world’s first museum migrant.